Happy Holiday Greetings to All! 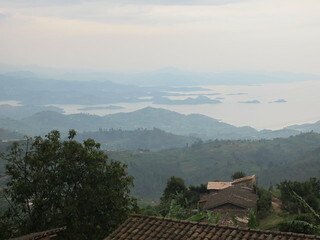 As this letter takes shape, April is sitting on the shores of Lake Kivu in northwest Rwanda. It’s pouring rain outside, with giant hibiscus dancing under the drops. Just a few kilometers down the road is Goma, Congo, where civil unrest rages and the M23 rebels have just taken control of the city. What she thought was thunder turns out to be gunfire (click the map to make it larger). Some might say she’s in a war zone, but she just thinks of it as an exciting albeit unexpected travel adventure. Given that she should probably keep a low profile until the situation settles, this is a terrific opportunity to say muraho (“hello” in the Kinyarwanda language) to our international friends and family of choice! Jerry may have been a bit further from Congolese rebels and gunfire, but he wasn’t sitting still. For him, 2012 was a year of broadening and deepening the Relationship Economy thesis, manifested in a series of speeches and videos we’ll point to as they happened during the year. 2012 has probably been one of the most intense, learning- and experience-filled years so far for us (though we’ve said that before). In a word, it’s been extraordinary. It has not been particularly balanced though – April spent the better part of 8 months on the road – and we are both committed to spending more time together, even if not always at home. This year got off to a REX-y bang. 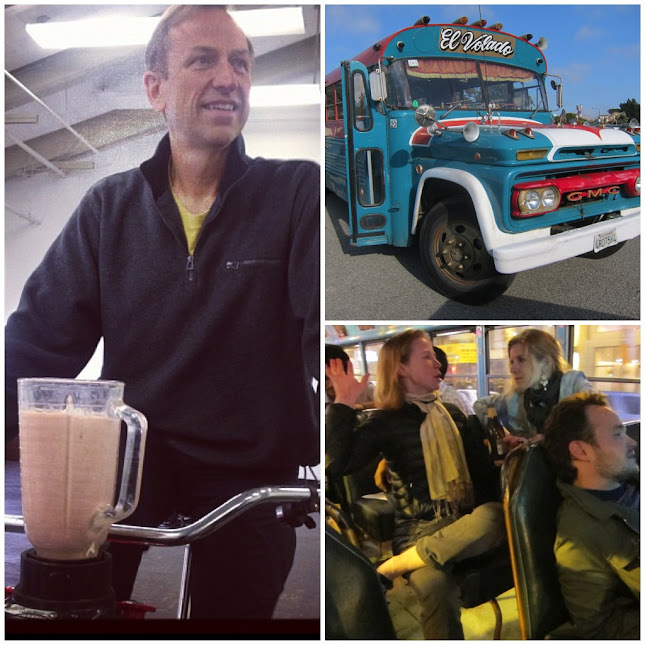 In January, Jerry hosted another REX offsite at the aptly-named Happiness Institute in San Francisco. Among many other things, they discussed four startup ideas blossoming from the Relationship Economy thesis. We’ll keep these under our hat for now, but watch this space. April has continued in her role leading WaterCredit at Water.org. She now works on four continents – US, South America, Asia and Africa – so you’ll often find her both working and taking time off at odd hours. This year has also included a deep dive into what’s known as the Sharing Economy (aka collaborative consumption) as a new way of doing business and creating value. We’ve started by sharing some of our things on Yerdle (founded by a friend) and Airbnb, but you can expect to hear a lot more about it soon. Separately, we’ve mentioned Jerry’s Brain frequently in our missives. He got a chance to talk about it in depth (well, for 30 minutes) at a conference near the end of January. You can watch his talk here. We took a long weekend for April’s birthday and went to Año Nuevo State Park to watch the elephant seals. It was a magical experience, made all the more fun by celebrating at Costanoa (a hidden gem smack on the Pacific Coast). We appreciated the relative slowness of January, as February through mid-July was a veritable sprint. Buckle up and get ready! In early February, April went quickly to Washington DC and then almost immediately re-departed for Cambodia. She spent most of the month there with colleagues assessing WaterCredit expansion opportunities. 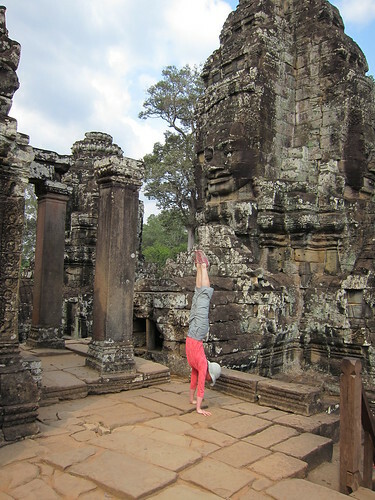 It was a great trip, with highlights including a 60 km bike ride through rice paddies and by temples, surreal meetings with very-old-school government ministries, and of course a handstand at Angkor Wat. The country is full of contrasts, and sometimes it is difficult to digest that the Khmer Rouge was in power only a generation ago. There are many positive trends and increasing foreign investment today, although poverty remains extremely high in rural areas. The one travel adventure April didn’t bargain for was having her passport, wallet, credit cards and basically everything swiped on her second day there. This resulted in 5 hours at the “Foreigner’s Disruption Police” station, an 8-page handwritten report in Khmer, three visits to the US Embassy and two trips to the Cambodian immigration authorities. She picked up her new emergency passport just a few hours before departure, and her original passport miraculously was “discovered” (soap-opera style) a couple of months later and returned to her. Despite all the hassle, April would be happy to move to Phnom Penh for a year or two – a truly delightful city. March brought one of the year’s – and maybe decade’s – highlights for April: a two-week YGL Global Leadership course at the Harvard Kennedy School. The YGL (Young Global Leaders) community continues to be a source of joy, inspiration, friendship and potential for April (and now Jerry too – keep reading). The leadership course is a keystone YGL experience: approximately 70 YGLs from around the world come together for learning, sharing and challenging one another to be their best selves. Although it’s designed for professional development, the course is also a personal journey. April’s a big fan of True North now and has spent a lot of time reflecting on her passions, life purpose, and what’s on the horizon. It was also fun to return to old stomping grounds – especially during Cambridge’s warmest spring on record. From Mexico, Jerry returned home to dive into work with the Institute for the Future preparing their annual Ten Year Forecast (TYF), which he has moderated for the past five years, while April continued onward to Bolivia for work. Her Water.org colleagues in South America conducted a series of WaterCredit market assessments in the region, and she participated in some of the meetings in La Paz and Cochabamba. It was a fascinating investigation, and it never ceases to amaze her how countries differ in their approach to water and sanitation. In addition to learning more about Bolivia’s infamous “water wars” and expanding her vocabulary (“open defecation” in Spanish, anyone? ), one favorite memory was driving across the stunningly beautiful Bolivian Altiplano at night, the highway lit by an incredible starscape and a feeling close to heaven. The next day she flew back to San Francisco and immediately joined Jerry at the Ten Year Forecast, which has become an annual highlight for both of us. Gradually we are rubbing off on one another in thinking about the future – in many ways Jerry is already living in the 22nd century. Okay, we are almost in May now. Still with us? May was a(nother) exciting month, especially for Jerry. He hosted his second REX offsite of the year and his annual, no-agenda Retreat. Both were wonderful, with “good people + good ideas + good intent” in abundance. At the REX meeting, after deep conversations about the future of leadership and globalization, REXers and a few guests took an evening progressive excursion on the Mexican Bus (a fun substitute for the Brewtruc we had scheduled, which broke down earlier that day), and made fruit smoothies the next morning on the Fender Blender. The Retreat was special, not only because a threat of bad weather turned into idyllic, picture-perfect days, but also because friends participating brought a Neolithic-era hand axe to hold (possibly 1.4 million years old! ), a studio-quality portrait setup to take pictures, and years of experience in aerospace, magazine publishing, geekier stuff like cyborg anthropology and more. April simply loved getting to participate in all of the activities, and she continues to be astounded by the strength and beauty of Jerry’s Community. The day after the Retreat concluded, April made her way to Seattle for a YGL Summit on the Future of Development hosted by the Bill and Melinda Gates Foundation. It was a fascinating gathering to learn more about BMGF’s strategy, priority areas (if you haven’t heard, Melinda is putting her hat in the personally for the first time and developing a specific agenda around access to family planning – hurray!) and meeting Bill and Melinda themselves. It was also very cool to visit the Microsoft HQ, experience their “home of the future” prototype, and learn about coffee and sustainability at Starbucks HQ. From the Pacific Northwest she dashed to Colorado in time for Memorial Day weekend and ran the Bolder Boulder 10K with her nieces Amelia, Ella and sister Allison. That has become a favorite annual tradition too – though soon Amelia and Ella might be faster than her. By the time April returned to San Francisco, Jerry had left for an awesome trip of his own, to Denmark and Sweden. In Denmark he spoke about education – a recurring theme for him this year – at a small, well-run conference called Rebuild21. (You can watch an eight-minute precursor to that talk here.) After Rebuild, Jerry took a short train ride across the Øresund to Malmö, to work for a couple of days with a fun Swedish startup called Higomo building an alternative currency platform for communities. While there, they did some “tura,” which means working on the 20-minute ferry for several back-and forth trips between Helsingborg on the Swedish side and Helsingør (which you may better recognize as Elsinore, the site of Hamlet’s castle) in Denmark. Shortly after he came back, April’s “Italian sister” Jessica came to visit for a few days of non-stop fun, including an excursion to Napa and Sonoma wineries. Throughout the spring, April had been learning more about the Sharing Economy. With the arrival of summer, her exploration ratcheted up a notch and she began getting more deliberately involved in a variety of activities. (If the term “Sharing Economy” is perplexing to you, here is a graphic that explains the key forces and trends behind it, and here you can find a few links to things April has written on the topic. The adventurous can try this link in Jerry’s Brain.) The Sharing Economy is broadly linked to the future of business, sustainability and – so to speak – “doing more with less,” something that basically the entire world can relate to these days. April had a chance to put some of her ideas to use at Create32, a futurist workshop she was invited to in the Austrian Alps. With the Austrian business federation, she and others spent their days imagining what Austria would look like in 20 years in terms of economy, education, environment and more. 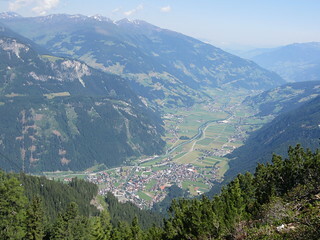 It was an incredible learning experience made all the more memorable by the stunning setting of Mayrhofen in midsummer. While April was in the Alps, Jerry was in Cannes. Yes, Cannes, on the French Riviera, where every spring the advertising world throws its big conference, called Cannes Lions. If you know Jerry at all, you know he’s working to replace advertising with authentic relationships, which is what he got to talk about there, while living in the lion’s den, figuratively if not quite literally. He also met child prodigy Adora Svitak who was in town to speak. Returning in early July, April had another <24 hour turn-around before we both headed to Colorado. (You must think she enjoys this level of hectic-ness. Trust us, she doesn’t.) We went back to Denver for April’s annual law school friends’ reunion and time with Allison and her family. It was wonderful to see good friends, even though jetlag hit hard and April slept through the best conversations. We’re now halfway through the year. Hurray! The rest of July was blissfully calm and local. We stayed put with no flights whatsoever for almost a month. It was great, although April realized how exhausted she was and Jerry realized that distance is sometimes a good thing (joke). April attended the annual YGL-led Silicon Valley summit (including a Grand Tour of “the” companies and a bonus hiking excursion) which reminded her a thousand-fold why we love living in the Bay Area and how tremendous her YGL experience is. We dove into a couple of DIY “wish list” home projects that had been brewing for some time. First, we renovated our basement, which we know call El Taller de Noe (the Noe workshop), basically priming, painting and carpeting it. An extra 250 square feet of bonus space in San Francisco is a great thing! The second project was made possible by the sad passing of three trees that had graced our sidewalk, but died of thrips. With our neighbors, we designed a sidewalk garden. Once we had the City’s attention, they moved quickly to remove the trees and approve our plans, which meant tearing out some concrete and planting three longish flower beds. We love the results. In August some fun travels began again, but thankfully they were together and did not require a passport. After celebrating the wedding of dear friends Charles and Sian in Napa, we geared up for five weeks on the road together – more-or-less one week in each of five places. It was truly a delight to hit the road in tandem again, and we rediscovered what fantastic travel buddies we are. 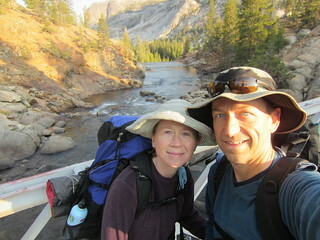 Our first stop was Yosemite, where we went hiking and camping with friends in the High Sierra Trail outside Tuolumne Meadows. It was spectacular and reminded us that we need to take more getaways close to home. After that, we popped up north to Point Reyes for a home swap – waking up with deer and surrounded by redwoods and wildflowers is simply a good thing. From there, we hopped on a plane to Cape Cod and spent a week at the Frank Lloyd Wright-inspired Airplane House in Woods Hole. Jerry attended a small, private conference for telecom geeks (one of his favorite ongoing events), while April took long jogs along the Cape and had a makeshift Art Deco office. What an incredibly special place. (Jerry’d been inviting April along for years, with little success. Seems like that won’t be a problem in the future.) We then headed down to New York City for meetings and to see friends. A big highlight was joining our dear friends Valerie and Max as they renewed their vows at a pond near Strawberry Fields with a truly beautiful gathering of kindred souls. This also gave us just the right kind of inspiration to move forward with our own wedding planning. Last but not least, a day after we got back from NYC we boarded a plane again – astounded that we hadn’t yet missed a flight or lost a suitcase – and headed to the big island of Hawai’i. We spent the next week at the perfectly rustic, stunning home of April’s mentor Baine. Words cannot begin to describe what a special place and time it was: waking up to the Pacific Ocean 10 feet away, sea turtles at our feet, “green flash” sunsets, hiking and exploring in Pololu Valley, and spending more quality time with Baine than ever before in the 20+ years April has known him. Bonus: April has now been to all 50 of the United States! We wrapped up these five weeks with big smiles on our faces, stunned by the generosity and inspiration found in so many places and within our community. Gratitude plays a big role in our lives, and we seek ever-more ways to acknowledge it – and give back – in our daily lives. While April could finally unpack her bags, Jerry had one more trip to take in September: back to Denmark! An organizer of TEDxCopenhagen was in the audience at Rebuild21 and invited Jerry to speak at TEDx. (If you’re not familiar with TEDx and the TED conferences from which they are a grassroots spinout, you’re missing out.) Jerry accepted Ole’s offer with great joy (and a lot of prep). Two other speakers from that day have stayed in Jerry’s memory: celebrity chef Claus Meyer (baking bread during his talk!) and Senga Manghezi describing how the free town of Christiania in Copenhagen dealt with a crisis. Jerry stayed a few days longer to meet with Higomo again, visit a beautifully built and run local school and give a short talk to members of a REX-like group in Copenhagen. On his return to the US, Jerry spoke at Applied Brilliance in Napa. On the home front, we were entertained by Ferdinand, a (probably female) squirrel we’ve been feeding on the back terrace, and who keeps getting bolder. Our current pictures of Ferdinand look pretty much the way a squirrel looks, so we’ll leave his/her adventures with us to your imagination, instead. Around this time, April’s efforts within the Sharing Economy also took an important step forward: she began leading the YGL Sharing Economy Working Group. The goals of this group will be to educate the WEF community and others about the Sharing Economy – what it is, opportunities, and potential challenges – and to integrate it within WEF events and agendas. It’s still early but she loves the task. October and November did not see any slowing of our pace and passions. April attended SoCap in San Francisco and Jerry attended Opportunity Collaboration in Ixtapa, Mexico (you may recall we both attended OppColl in 2011, for the first time). There, Jerry ran a couple of sessions about education (again) and met amazing social entrepreneurs. April also went to Portland, Oregon for a first-of-its-kind workshop on Legal Tools for the Sharing Economy. She loved it and is excited to see lots of opportunity (and need) for policy reform in this space. It makes her happy to don her legal cap again (go figure!) and gives her a sense of déjà vu back to the early days of microfinance. You can read more about it here. She also returned to the Big Apple to speak at a microfinance conference and enjoy perfectly-timed autumn colors, barely missing Sandy. She was admittedly shaken but tried to look cool about the situation. Thankfully the people staying at the same lodge were largely unflapped. 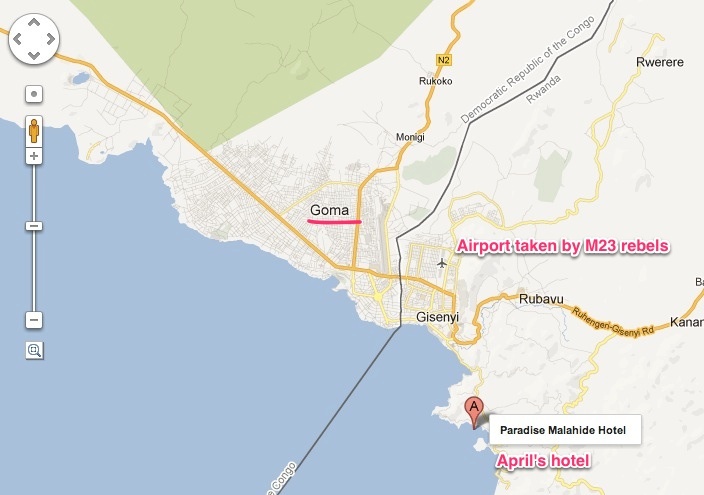 Most of them had actually fled Goma to Gisenyi, so that was a good sign. She ditched her original plan to sneak across the border for a quick photo op (darn!) and instead lay low on the lake shores and practiced her French. A couple of days later she headed south to Kibuye on a 7-hour spine-cracking dirt road packed like sardines in a minibus. The discomfort was pretty intense (several passengers lost their cookies), but it was worth the views: 360 degree panoramas of lush terraced tea plantations, sleepy village life and children running after the bus because, well, that’s the most exciting thing around. The area reminded her of some combination of the Philippines, Bali and the Sacred Valley of Peru: breathtaking! Having swapped Thanksgiving turkey for ugali and warm beer, it was time to start the journey home. She took advantage of a weekend-long layover in Brussels to visit old friends, break up jetlag and revisit the city. Timing was good, as it was Chocolate Week and Brusselicious time. Equally memorable were the Magritte Museum – as surreal as one might expect – long walks and unparalleled beer. That said, she will never, ever adjust to northern European wintry sunsets at 4pm. While April was bathing in Belgian chocolate, Jerry was rethinking how he presents REX, which in this day and age means redoing its website and shooting a veeery simple explanatory video, which you’ll see front and center there. During the year, we’ve both been working with Marti Spiegelman, a friend, colleague, mentor and REX Fellow who helps bring people into full consciousness (we apparently are usually only in a small fraction of it, thinking linearly). Finally we arrive at year’s end. December means Jerry’s birthday and Christmas in Colorado with family. We are beyond grateful. Looking toward 2013, we are full of anticipation about what looks likely to be another extraordinary year. One of the year’s highlights will occur early on: April has been invited to Davos! She is humbled to have this opportunity and eager to see what “the” gathering is like. “Excited” is an understatement. She also will be spending more time in the Sharing Economy and collaborative consumption space. That’s a bit much about us, but it doesn’t mean we’re not thinking about you. We hope your 2012 was terrific, and that 2013 has even more good things in store – as long as the Mayan Apocalypse doesn’t take us on a detour a few days from now. Finally as is now usual, for the adventuresome: 2012 in context, in Jerry’s Brain. Glad to read about your very busy and productive. We wish you more of the same in the coming year. Thanks for this wonderful letter! Happy Holidays April & Jerry! Our card is on its way — hopefully it will arrive properly this year for a change. Let us know when you are next in Atlanta as we’d love to see you! April, I am your Tucson fan from a B&R trip of yesteryear. I love reading about your adventures, so please keep me on your list. Trouble is, I wonder — after learning about your amazing comings and goings, speeches, consulting, seminars, intellectual pursuits — if my life is hum-drum by comparison. Conclusion: noop! Life is good for an aging lady. Keep trekking, dear, sweet, young friend. We always love receiving your Christmas letters…I await them each year as I so look forward to reading about your adventures! This past year seemed like another special one for you! Please send me your current address as last years Christmas card was returned to me…1379 Vallejo Street, number 5. We wish you both a wonderful, adventure filled 2013! And maybe a wedding too! In any case – nice to stumble across a familiar face in a very unexpected way here on the internet – it seems you are both doing well – I loved reading about your adventures! Are you both here in Davos? If so it would be lovely to see you to say hello! with the impact the two of you are making on planet earth. wedding plans. I am retired in Boise, Idaho and should you pass through, please give me a call @ 336-0066. April, I have been captivated by your life. Each year is a treat (takes a couple of weeks to read all the way through). I would like to send Jerry’s information and website to someone I think may be interested in it. Would you send me the website so I can forward it to him? Thanks, and please keep us on your list. I think of you often. Previous Previous post: Happy Holidays 2011!